Rodfei Tzedek (Pursuers of Justice) is the social justice team of Rodef Shalom. We are currently working with "Together Colorado", a faith based community organizing group, as well as issues related to food security and justice in our state and at the Federal level. Please join us if you have an interest in this work. Contact Donna Brown with any questions 720-301-5659. For more information contact Meredith Levy. Rodef Shalom has been an integral part of Habitat Interfaith Alliance (HIA) for 16 years. We are a dedicated group of representatives from 13 congregations in the Denver Metro area. Our coalition is made up of Catholic, Protestant, Unitarian, and five other Jewish congregations. Since HIA began in 2001, Rodef Shalom members have joined with other coalition members to build more than just homes. We have fulfilled the dreams of 16 families by providing safe, affordable housing for grateful parents and their children. 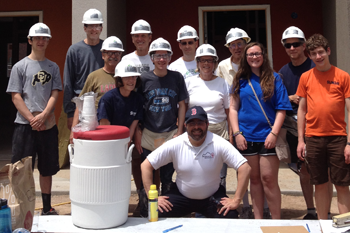 HIA is one of only two interfaith affiliates under the umbrella organization, Habitat for Humanity Metro Denver. Within Habitat Interfaith Alliance, we may not share the same faith, but we do share the same values, especially the idea of Tikun Olam. By working together over the years during the planning, fundraising, and home builds, we continue to demonstrate that people of different backgrounds, faiths, and cultures can create something much more than mortar and bricks. We are building community, addressing the issues of poverty and homelessness, and making positive connections among each of the volunteers who participate in these efforts. With the help of our fellow congregants and volunteers, we reach our yearly goal to raise $85,000 (the cost of all the building materials) for one Habitat home in Metro Denver and one in a developing country (via Habitat’s Tithe Program). These homes are not given away, but sold to the recipients who also work many hours to build their home as well as other recipients’ homes. The loans are low interest and payments are affordable. Habitat has a fine reputation for building energy efficient and sustainable homes. Our current build began in April and will be completed in August. Dedicating a new Habitat home is very gratifying. We will publicize the event so all can celebrate with our Habitat family. If you have any questions or want more information, please contact Leslie Tjarks 303-220-0189 or Janet Smith 303-755-4333.